The time has come for President Barack Obama to restate why he is fit to lead the United States for another four years as the 2012 Democratic National Convention kicks off on Monday, September 4. It will be held at Time Warner Cable Arena in Charlotte, NC and will be available to stream live online for free. To watch the Democratic National Convention live online, absolutely free just visit FreeCast’s Live Events page when the event gets underway. 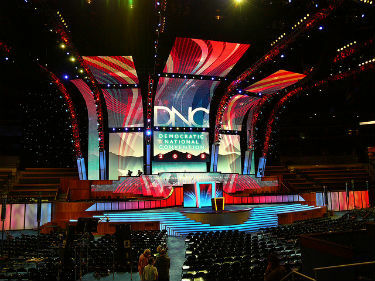 The DNC will be held at Time Warner Cable Arena for the first three days before wrapping up Thursday night with Barack Obama’s official nomination at Bank of America Stadium. You’ll be able to watch the Democratic National Convention live online from start to finish with the help of FreeCast. Among the many people that will be speaking at the 2012 Democratic National Convention are San Antonio Mayor Julian Castro, Chicago Mayor Rahm Emanuel, US Senator John Kerry, Georgetown Law School graduate Sandra Fluke, House Democratic Leader Nancy Pelosi and former president Bill Clinton. Be sure to watch the Democratic National Convention online live when all of these speakers and many more take the podium. First Lady Michelle Obama and ‘Desperate Housewives’ star and Obama Campaign Co-Chair Eva Longoria will also be making speeches at the DNC in Charlotte, which you can watch live online for free. Famous musicians like the Foo Fighters, Mary J. Blige, James Taylor, Delta Rae, Earth, Wind and Fire and Mark Anthony are among the performers for the Democratic National Convention, with Anthony singing the national anthem on the final night. Fortunately, you’ll be able to watch all of these musicians perform, live online for free when the 2012 Democratic National Convention gets going. On the fourth and final night of the 2012 Democratic National Convention, Barack Obama and Joe Biden will officially accept the Democratic nominations for president and vice president in front of thousands of delegates in attendance at Bank of America Stadium and millions of viewers watching at home. Remember to visit FreeCast to watch the 2012 Democratic National Convention live online for free from September 4-6 as Obama and his supporters address the nation. To find free live streaming coverage of the Democratic National Convention online, just visit our Live Events page. You can also watch the Democratic National Convention online live with your tablet or mobile device.